If this is your first taste of our church we are delighted that you have visited us on the internet and hope that you will also visit us soon "in the flesh". Our Sunday morning service is at 11:00. See our "Worship" page for more details. 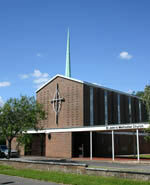 We have strong links with other local churches. We extend a very warm welcome to you and your family to join us on Sunday morning at 11:00 a.m. for worship and a cup of coffee afterwards. We want to make Sunday Special for you and hope you find refreshment and renewal of body, mind and spirit. We wish to serve and support you. Please do not hesitate to let us know if we can, in any way, be of help to you.